Home product trends inevitably come and go over the years, but one of the current trends you’ll find in many home products is that of the matryoshka design. Perhaps better known as the Russian Doll – little wooden nesting Russian dolls that stack inside each other – matryoshka images have been gradually springing up in homeware products over the last few years. Originating in Russia, the design became popular in Japan, before heading west and has been seen in everything from stationery and jewellery, to fashion and homewares. It’s not unusual to find trends from fashion making their way into homewares and, in the case of the Russian doll image, it works remarkably well as a cross-over trend. As well as being used as an image in its own right, it’s also often blended with wider folk themes, eclectic Romany styles and rich and vibrant colours, although sometimes you will find more subtle, muted colours too. Like many other trends, it’s probably not an image that you’d want plastered all over your home, or as a design on multiple products in your house, but used in moderation it can provide a quirky and colourful splash of interest. Most matryoshka homeware products tend to be bright and colourful, like this set of four wonderful matryoshka china mugs, which is great if you want to inject some colour into your home. For the quick esppresso hit, try the Matryoshka espresso cups. Or, for a slightly more subtle design, that will last long after the trend has passed, choose a more stylised piece, like these matryoshka decorative figures, which offer a contemporary take on the Russian doll design. 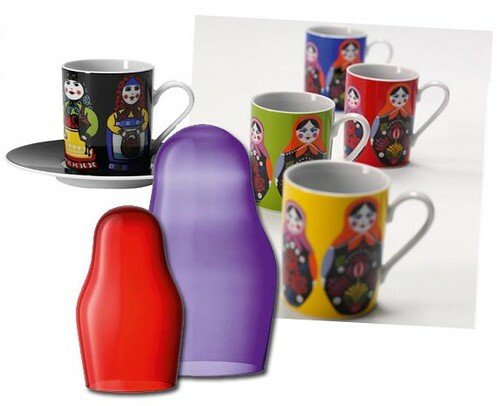 What do you think – do you love the matryoshka trend in home products?